It has rained in Kentucky almost every single day for the past year, so grilling has just not been an option for me. About a month ago, I ran across a video of Gordon Ramsay making turkey burgers in an air fryer, so I decided to try a few things and see how they turned out. The first thing I tried was these Air Fryer Mini Burgers with Cheese. They turned out so amazing…perfectly charred on the outside and nice and juicy on the inside! 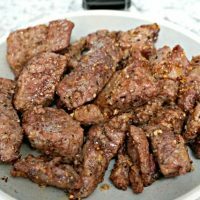 I was floored that my air fryer could do that, so I decided to try steak in the form of steak tips or bites. I bought mine from Trader Joe’s, but you can find steak bites (steak cut into bite size pieces) in most grocery stores in the beef section. I couldn’t believe how easy they were to make, but I documented the entire process from start to finish on my Instagram stories…you can find them HERE under the Food and Drink Tab! I love sharing easy ways to cook food on IG stories, so make sure you are following along on Instagram by following me @mom4real! 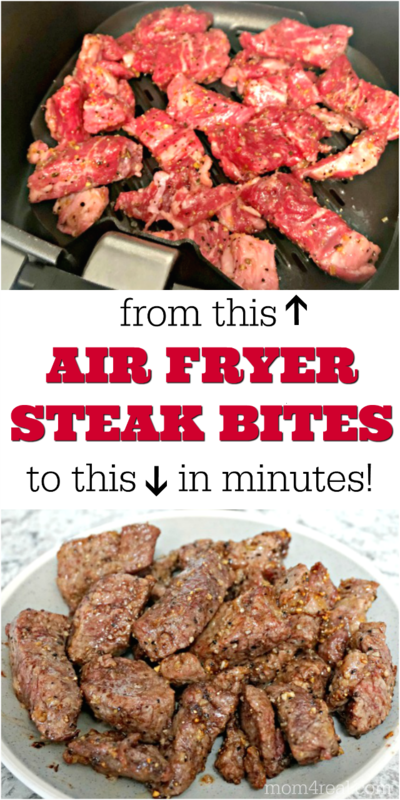 Okay…onto the air fryer steak bites! 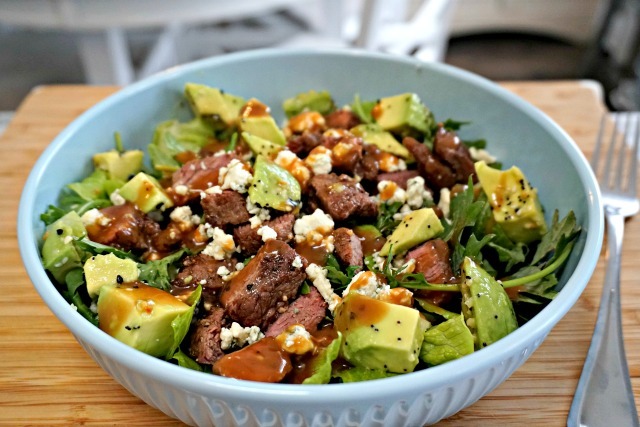 I love these steak bites tossed in my favorite Black n’ Blue Salad with some avocado and baby kale! It is absolutely to die for and low carb/keto friendly too! Try them tossed in Sesame Seeds either before or after frying for an added nutty tang. They are particularly tasty done like this with a salad. I too am a confirmed Air Fryer devotee – and I have 2 as well – a 10L and a 4L and they get used daily by and for my family.